In architectural visualization, you will find that some artists are slowly migrating to game engines as their primary work software, because of all the benefits of interactive real-time rendering. You can create immersive presentations for your projects with those tools. Some of them are even free for architecture and design, like the Unreal Engine. Have you ever heard about another engine called Lumberyard? 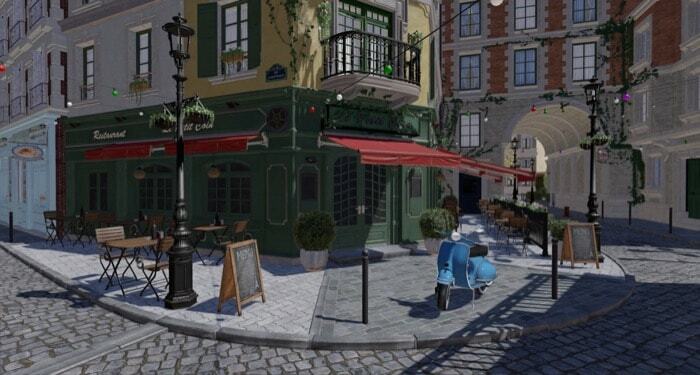 That is a project from Amazon to offer a full-featured game engine, which could also help architectural projects. However, we will not focus on the features and benefits of Lumberyard. Instead, I will recommend you to download a â€œdemoâ€ scene for the engine that will also work in Blender. Both 2.79 and 2.80 versions. The scene is an urban environment called â€œBistroâ€ that has an ample space full of external buildings and interiors. Besides getting the models and textures, you can also make use of the assets. They are far from anything related to modern furniture but could help in a future project. In the zip file (850MB), you will get files for the Amazon Lumberyard engine and also some FBX models that you can use with Blender. There are two FBX files inside for both exteriors and interiors. You will also find textures and some HDR maps. It is a great resource to use for your projects for either commercial jobs or practice. If you were looking for a challenging scene to render with Eevee and the new Blender 2.8 make sure you try to import both FBX files. If you decide to use the material, you must take a close look at the license. According to the description page, it has a creative commons attribution. That means you can share and adapt the material freely, but must always give credit to the author.